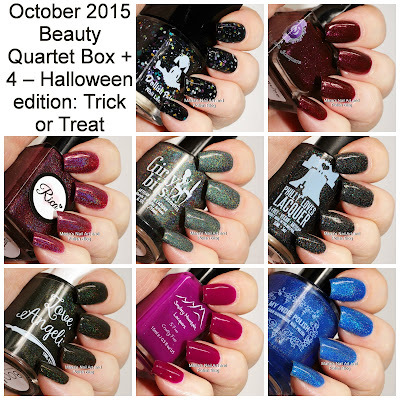 Today I have the 2 next polishes from the October 2015 Beauty Quartet Box + 4 – Halloween edition: Trick or Treat, a limited edition with only 50 boxes. Philly Loves Lacquer and Smokey Mountain Lacquers celebrated their one-year anniversary of the Beauty Quartet Box by making a super-sized box – the BQB+4. It included 8 exclusive limited edition bottles of nail polish from Philly Loves Lacquer, Smokey Mountain Lacquers + the guest indie makers: Rica, Dollish Polish, Gothic Gala Lacquers, Love Angeline, Girly Bits and My Indie Polish. Philly Loves Lacquer Burning Rain Of Death is a black polish loaded with multi colored micro glitters and a dash of holo sparkle. It is very opaque in one coat, but this is two with a coat of Seche Vite. My Indie Polish Blue Moon is a beautiful and squishy sapphire blue jelly holo. For normal use two coats are enough, but for these photos I added an extra + a coat of Seche Vite. I am not a big blue polish fan but this time Blue Moon won my heart! That's quite a compliment for this polish! They are very different - so beautiful in each their way - and depending on our mood too!